So on your outlook 2003 your getting an ole registration error occurred. Well don’t stress, its an easy fix. Microsoft were nice enough to give us a feature within SQL 2005 which would allow us to grant a user permission to do a SQL trace using Profiler, without having to give them SQL SYSADMIN access… which is GOD access… that’s a big no no. For the SQL 2000 users sorry you still have to use sysadmin access but I did come across a nifty trick that may do the job. up, most around $30) and compiled the batchfile in to an executable. You might get the below event error if Database mirroring fails, or the auto failover for some reason does not work. This below error will be found only on the witness server. The mirroring connection to "TCP://xxxxx.domain.com.au:5022" has timed out for database "YourDatabaseName" after 10 seconds without a response. Check the service and network connections. You can easily increase the time of the time out of the mirror timeouts. This will increase you database time out to 30 seconds. First thing is first, Find the mailbox you wish to delete within the console, once you have located the account right click and choose remove, be warned this will also remove the AD account associated with the mailbox if you only want to remove the mailbox then choose disable. Ok so you have now disconnected the mailbox you can no longer see this in the mailbox list, and there is a good chance you cant see it in the disconnected Mailbox just yet either. This clean-Mailbox database is the same as the clean up agent that was found in 2003’s GUI, once you have successfully ran this command go back to the GUI and see if you can see the mailbox you removed in the ‘Disconnected Mailbox’, once you can see it you will be able to delete the mailbox if not see step 5. Now that we can see the mailbox here we need can then purge the mailbox do this by running the below command be sure to change ‘MailboxDatabaseHere’ to your Exchange database and also change the ‘DisplayName’ to your account name, found using the above script. That’s it your mailbox is no longer you have successfully purged it, not so hard after all. The slow uptake or even non existent uptake of the VISTA operating system was due to incompatibility of drivers and applications, now that VISTA has been around for a while, and all major vendors now fully support Vista / 2008 server, being that windows 7 shares quite a bit of VISTA codebase in terms of drivers support. Windows 7 also seems to have a very prominent place in the WWW, with major vendors jumping on board the beta band wagon, releasing pre driver support, Microsoft also already offering upgrade paths, in association with all major PC vendors, such as Dell, HP, Asus the list goes on. With that said its seems with the release of VISTA and the long public beta releases of windows 7, may of payed off with, thus compatibility between devices is a thing of the past. what this is, is essentially a Virtual PC (VPC), but wait before you stop reading its a whole lot more than just a VPC… While they now support USB within the VPC, which is a vey nice addition. The VPC fully integrates with the guest OS, what this means is if you install an application within XP VPC, it will appear within the windows 7 start menu, meaning you can launch the application from your primary machine without having to interact with the VPC at all. Why is this such a big deal, and why should this help the SMB market take to windows 7 as there next OS? Simple windows Vista no longer supports 16 bit applications, as it does not have a 16bit sub system like XP does. With the XP mode 16 bit is supported, therefore for all those SMB’s that have so many of those legacy systems that are 16bit based that couldn’t go to VISTA because of this reason, but yet IT managers, CTO’s and CEO’s didn’t want to spend the money to re-develop a 32bit version, when they have a perfectly good working application. With XP mode 16 bit is very plausible that you can run your 16bit apps directly from windows 7! With the overhaul of the task bar (referred to as the superbar), jump lists, ‘Aero shake’ to quickly minimize all apps apart from the shaken app, and the massive additions of shortcut keys that interact with windows 7 (many can be found in my previous blog post) All of these significantly increase the speed of which a user can work, while some seem very gimmicky like the Aero shake, it actually serves a unique and quick outcome. The other side to efficiency of windows 7 is not just in the shortcuts and the new features but yet the OS it self has significantly improved on boot and shutdown times, It’s processing of newer applications on modern hardware is superior over XP, where windows 7 uses the processor and memory more efficiently. Also for mobile users battery life is increased, it is said they they have reduced the power draw by up to 15%, and other tweaks for notebook users. Last one is not for everyone but the fact that windows 7 allows Muti-touch, this can significantly speed up the processes of how quickly you can access your apps and files. Ok So I have installed windows 7 (7100) on my little EeePC 900, the EeePC has 2 gigs of RAM and a small 1.6 Atom, with this small combo 7 smashes the pre-installed XP. Boot time is better by about 5 seconds and general performance to open applications and general processing is just far better, while it uses substantially more memory than XP, but lets face it all new entry level PC’s have 2 gigs of RAM these days. But with saying that I would blame a lot of the memory usage on the rotten IE8 that is bundled with windows 7, I have many complaints about this browser, so rather than complain I am finding I am using Chrome more regularly, faster better on the memory and processor. MS if you read this use the KISS principle (Keep it simple stupid) Google has done this very well for years. Anyways lets get to the shortcuts and handy little functions that windows 7 has added! My absolute favourite function has to be the if you have multiple screen configurations, you can click on a maximise screen and drag it to your other screens. Previously we had to resize / minimize and then move the open window to a new screen and then maximize… very annoying. Previously running an app in administrator was a right click, and then run as admin , while that still exists there is a quicker better way of doing this with keys: It’s now as easy as holding CTRL + SHIFT when you open the application. Another one for those with multiple monitors: Windows + SHIFT + Left (or Right) will shift a window from monitor to monitor. Windows 7 now burns ISO files themselves instead of making us install unwanted third-party apps. In the case that something happens to your system, you can make yourself a system repair disc. Just search “system repair disc” in the start menu. For the advanced users finally a desktop OS that gives us the ability to setup software RAID, one of my favs! Multi-Threaded File copy, this is by use of the command line robocoy which is included within windows 7, this is something I personally use on a constant basis, and is very powerful, if you haven’t used this before you are missing out! UAC is substantially improved, where there is no need to turn this off any more, it only disturbs you on install of applications. this is something I turned of on VISTA as soon as I could, but one windows 7 I Have found that its something that’s not annoying and have left it on its default setting. Its also now provides us with a toggle bar where we can increase or decrease the default UAC settings. A new calculator- about time it only took about 10 years! Owh yeah an codec’s to play AVI Divx and other regularly used formats FINNALY!!!!!!! And the whole OS is touch friendly! Another feature I will be talking about in more depth is the default install XP with program integration as a virtual machine. I will be blogging about business reasons as to why corporate should go the distance and install windows 7. Don’t stress it is the same problem / error that I blogged about earlier with VISTA activation problems, just using a different error message. Here is the blog post for the Vista activation fix, it also works for 2008 server. Internet Information Services (IIS) have some interesting new features in Windows Server 2008 R2, which justifies the new version number, i.e. 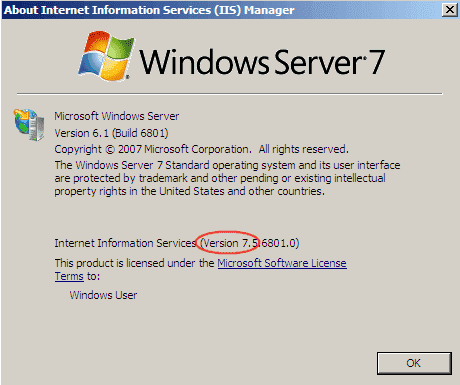 IIS 7.5. Most noteworthy is that you can now run ASP.Net applications on Server Core. Of course, it will reduce security if you install .NET on Server Core, but IIS without .NET doesn’t make much sense either. The performance-related improvements are not very exciting in my opinion. However, support for 256 logical processor cores makes Windows an interesting server OS for cloud computing. 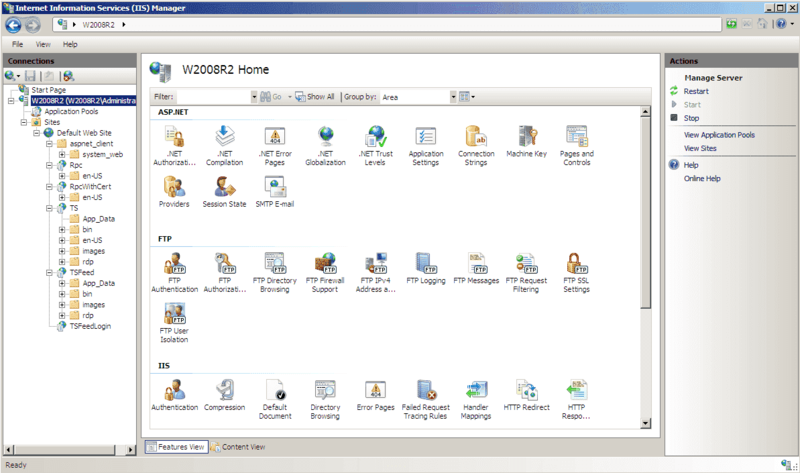 Another awesome feature is the Inbuilt IIS reporting and SQL management.